Finca Villa Nora (finca is another word for hacienda) is a heritage country house with more than 120 years of history and tradition in coffee culture. 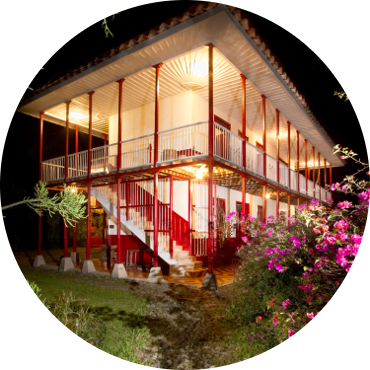 The house was built in the early 20th Century and in the last two decades has been refurbished to provide the best accommodation for tourists in the coffee growing axis (Eje Cafetero – Quindío). The two-story house is a great example of the Antioquian Colonization Coffee Architecture with spacious corridors, terraces and wide wraparound verandah. It provides wonderful views of our preserved Bamboo Forest (Guadua) and the majestic Andes Mountains which give visitors unique sunrise and sunset experiences. The house is surrounded by more than 10.000 square meters of lush gardens with rare tropical species of flowers and plants including 30 different species of heliconias and orchids, exotic trees and stunning butterflies and birds. If you want to explore the Coffee Growing axis which has an average year round temperature of 24°C or simply relax by the pool and enjoy the peaceful surroundings, there is no better place than Finca Villa Nora.